Your first sneak peek at Erin Square by Pemberton! We have some exciting news for you – Pemberton Group has given us a preview of the exciting renderings of Erin Square. We can also share some more details, including an overview of the open-concept suites, amenities, features and finishes, and starting pricing! 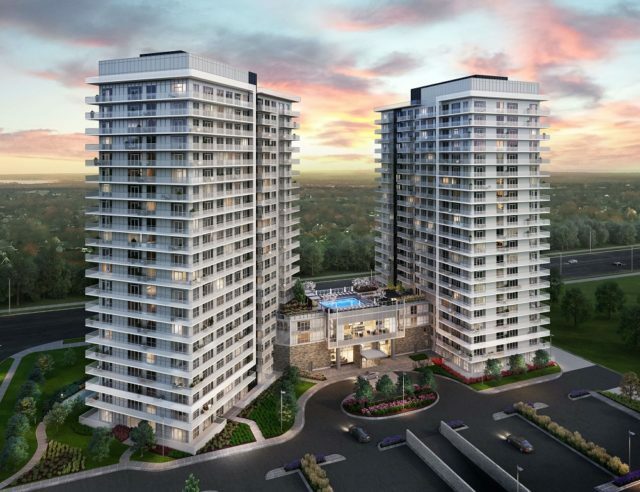 Coming soon, Erin Square will be the newest addition to Pemberton’s master-planned Mississauga condo community. It is comprised of twin 22-storey towers connected by a podium that is home to the incredible amenity spaces designed for your recreational, health and wellness, and entertainment needs. The outdoor pool has poolside lounge chairs and cabana-style seating, ideal for enjoying warm weather. When it comes to staying healthy and fit, you’ll appreciate the large gym featuring cardio equipment, as well as boxing and yoga/Pilates areas, and change room with saunas. 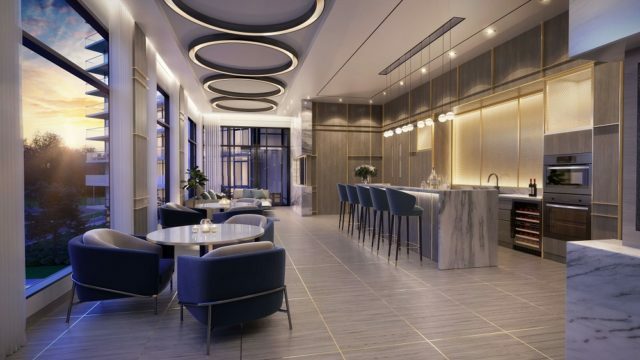 For entertaining and mingling with friends and neighbours, the party room has a bar, caterers’ kitchen, a private dining room, and a lounge that connects to two outdoor terraces with panoramic views. There will also be a media room, a games room, and guest suites. It’s common these days to see pets in condos, so it makes sense that Pemberton has included a dog wash at Erin Square. The spacious selection of floorplans at Erin Square will span from one-bedroom plus den, to two-bedroom, and two-bedroom plus den layouts. A few of the impressive features and finishes (all as per plan) include: 9’ smooth ceilings in principal rooms, a patio or balcony, 71/2”- wide laminate flooring, custom quality kitchens with a full-size appliance package and quartz countertops, bathrooms with soaker tub and separate shower, and stacked washer and dryer. 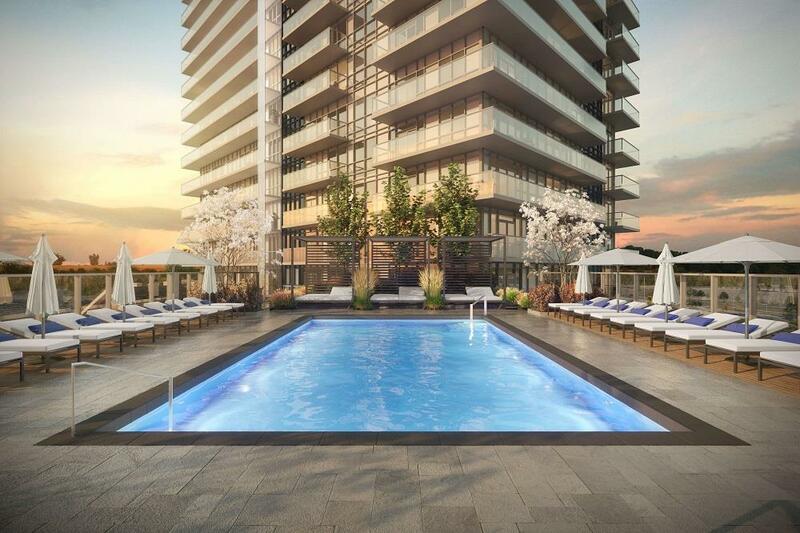 Located in the heart of Mississauga in the sought-after Erin Mills neighbourhood – just west of Eglinton Ave. West and Erin Mills Pkwy., Erin Square is surrounded by a wealth of area amenities! There are many schools, parks, recreation centres, and of course the premium destination shopping at Erin Mills Town Centre, which offers hundreds of shops, including big box stores, boutiques, and brand name restaurants. Getting around is a breeze thanks to the quick and easy access to the rapid-bus station, which is part of the Mississauga Transitway, offering MiWay and GO Bus service. Highways 401, 403, and 407 are also just a few minutes away! Register for Erin Square today! 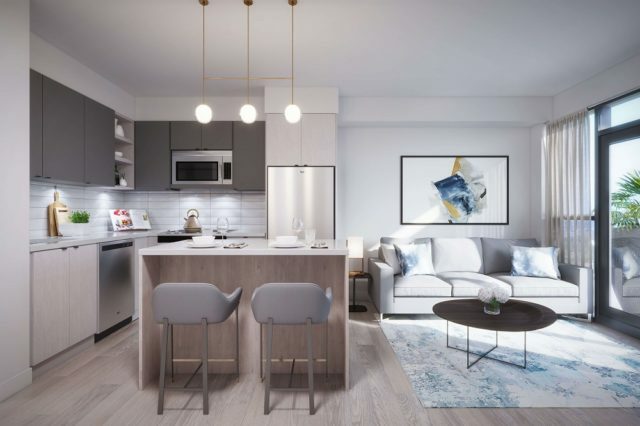 Erin Square is one of the most highly anticipated new condo communities in Mississauga, so you should register right now to be among the first to receive updates. Prices at Erin Square will start from the low $400,000s. To stay updated on all of Pemberton Group’s condo communities – both now available and those coming soon to coveted locations across the GTA, subscribe to Pemberton’s quarterly e-newsletter.